Premiered tomorrow is a new digital restoration of the 1928 British silent The Wrecker, with a new score by Neil Brand. The film, based on a play by Arnold ‘The Ghost Train’ Ridley, was directed by Geza von Bolvary and stars Carlyle Blackwell, Benita Hume and Gordon Harker. It concerns a series of train wrecks which are engineered by the fiendish owner of a rival motor-coach firm (it is a very British film), and its big selling point is a spectacular train crash early on in the film which was staged for real on the Basingstoke to Alton Light Railway in Hampshire, a sequence involving a remarkable 22 cameras. The premiere takes place 7.00pm at The Watercress Line, Goods Shed, Alresford, Hampshire, but you can also purchase the film on DVD. It comes with an impressive set of extras, including a 9.5mm version of the film, numerous other films of rail crashes (if that’s your sort of thing) and an illuminating interview from the habitually illuminating Mr Brand on composing the score. Those in the UK can also see a short report on the film, with the rail crash clips, on the BBC News site, featuring film historian Bob Geoghegan. Some of the shots of the train crash were later used in the 1936 film Seven Sinners, starring Edmund Lowe and Constance Cummings, also recently released on DVD. It isn’t silent, but it is one of the Bioscope’s favourite British films of the 1930s (a delightfully witty script courtesy of Launder and Gilliat) and comes strongly recommended. The best 1930s Hitchcock film that Hitchcock didn’t make (Albert de Courville was the man at the helm). Speaking as a railfan, I have to look for this dvd. For some reason, people who love trains seem to be fascinated by seeing them wrecked. 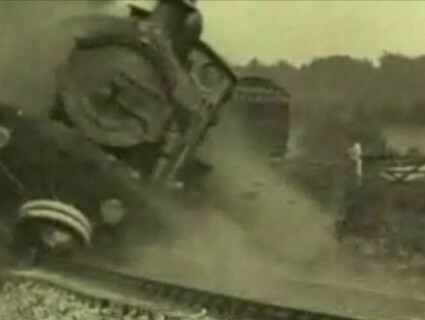 Head-on collisions actually became organized entertainment in the late 19th Century, in events like the Great Crush Crash. I’ve seen the film, and frankly it’s terrible, wooden in the extreme and saved only from being a whole lot worse by Neil Brand’s inspired score. I must confess to a strong adversion to trains (possibly because I’ve been condemend to travel on one twice a day to earn the daily bread for the past twenty years), though a good train movie (Rome Express, Seven Sinners, Night Train to Munich) is hard to resist. The fascination with trains being wrecked shown by the DVD I find creepy. Anyway, it’s attracting a lot of interest and will probably go on to be the most successful British silent DVD ever.